Philadelphia Eagles defensive end Chris Long (56) and defensive tackle Fletcher Cox (91) celebrate a sack against the New York Giants during the fourth quarter at Lincoln Financial Field. Philadelphia Eagles defensive linemen Fletcher Cox and Chris Long would prefer to be preparing for this Sunday's Super Bowl, but in the absence of that, bantering on Twitter works fine. Without ever saying a word to one another, the interplay of these guys' last names was a gift from God. Their senses of humor only add to the joy. In a since deleted tweet on Monday, Cox complained to American Airlines about the attitude of a flight attendant. "So I'm done about had it with this @AmericanAir flight attendant... brah should try being nicer to people," Cox tweeted. Cox soon got a strange reply from American Airlines, or so it seemed. 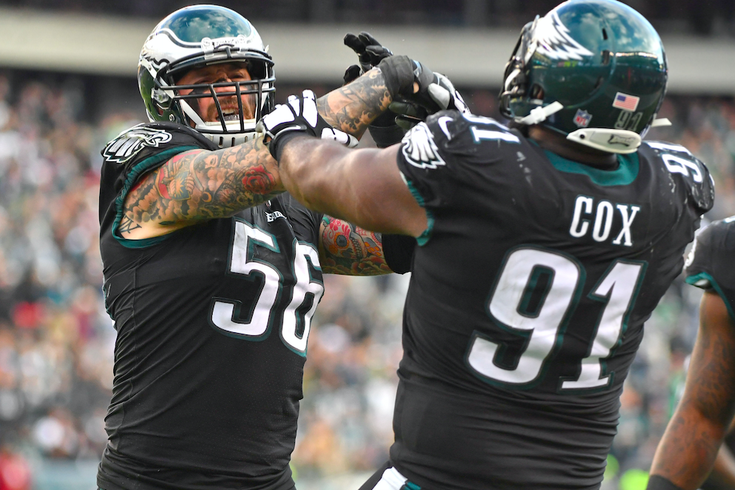 Eagles' Chris Long trolls teammate Fletcher Cox. If you were to click through to the American Airlines account here, you'd find that Chris Long changed his whole profile just to troll Fletcher Cox. Cox got a good laugh out of it, despite his in-flight whining. What makes this even better is that it's not the first time it's happened. In 2017, Cox complained about flight delays he was experiencing with Delta Airlines. Long pulled the same stunt. This time, the actual American Airlines also responded to Cox's complaint. The crew should be polite, because we're really happy to have you on board with us. You can send us a DM with your flight info and details. And Long, on Wednesday, summed up that reflexive response – and that awkward moment – everyone has had with a person in customer service. Jokes aside, Cox and Long teamed up this week for the First Quarter for Literacy Drive that Long and his wife, Megan, launched last year to provide books to children in underserved neighborhoods. Cox, who accepted his teammate's challenge, will distribute 5,000 books to 1,000 kids in his home state of Mississippi this week. Long hasn't yet decided whether he'll return for another season or retire, but you have to figure team chemistry, like these two have, is one of the reasons the Eagles' defensive line has been the team's strength in recent years.